Can Jets Fans Name Five Jets Players? When I set out for the Meadowlands on Sunday morning with Anders Kapur, I hoped to find tailgating Jets fans who were in a good mood. 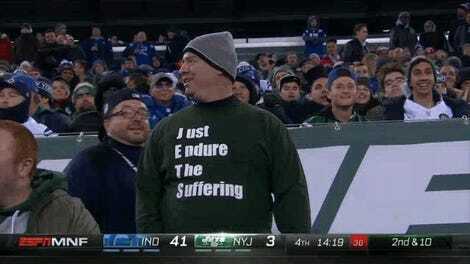 This might sound like an impossible mission—are Jets fans even capable of experiencing joy?—but my interactions with Jets fans through the years have taught me that their fatalism is often leavened with a deep, abiding sense of humor. Jets fans know they’re doomed, but damnit if the best way to cope isn’t to laugh as much as possible at their station in life before the anvil that’s falling from the sky hits them right on the head. Again. The broader, more salient point is that Jets fans have accepted this year’s tank job as a means to an end, and they’re okay with that. Lucy has yanked the football away from them so many times, yet they still stick with their Jets out of a steadfast belief that someday they’ll get the chance to kick the damn ball, and that once they do, it will sail through the uprights straight and true. 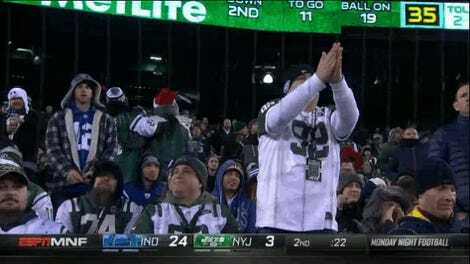 Another hope I have is that someday every Jets fan gets to experience the joy of winning a Super Bowl. You’re good fans, Charlie Brown.